Trustworthy Brewing Co. Verdugo West Brewing Co.
Our mission at Trustworthy Brewing Co. is to create inspirational beers that are both exciting and fun to drink. To provide our guests with a welcoming and educational taproom experience. To allow our customers to enjoy the freshest beers that are brewed in a consistent and trustworthy manner wherever you are drinking our beer. We do not accept reservations. Tables are on a first come, first served basis. Brew playful and inspirational beers and have a good time doing it. Being true to ourselves, our customers and our beer. Doing what is best for the beer and not our margins. The beer world is ever evolving. We want to constantly educate our staff and guests on beer production, beer history and beer styles. The beer comes first, always, no matter what. We never stop learning about or tweaking our beers to make them better each and every brew. To our customers, the environment, our employees and our business. We hold ourselves and our staff to the highest standards. Our beer does all the talking. You can purchase growlers to-go from our taproom until 10pm. We will also fill other breweries' growlers as long as they are clean and all markings and logos are covered. Sunday Discount Growler Fills are $4 off 64 oz fills and $2 off 32 oz fills. Please just holler at us if you'd like to visit our taproom with groups of 15 or more. We wanna make sure our staff is ready for ya. Please email scasola@mcchgroup.com with the date, time and number of guests so we can be awesome to you. The taproom is open to dogs, as long as they are on a leash. We have treats and water for your pup! Welcome! All of our tables are kid friendly. Our taproom is available for private events on Monday and Tuesday evenings. If you are interested in more information, please email ghales@mcchgroup.com. Brewmaster Chris Walowski joined MCC Hospitality Group in 2016 to launch Trustworthy Brewing Co., bringing with him several years of professional brewing and consulting experience for some of LA’s top craft breweries, including Smog City Brewing Company in Torrance. 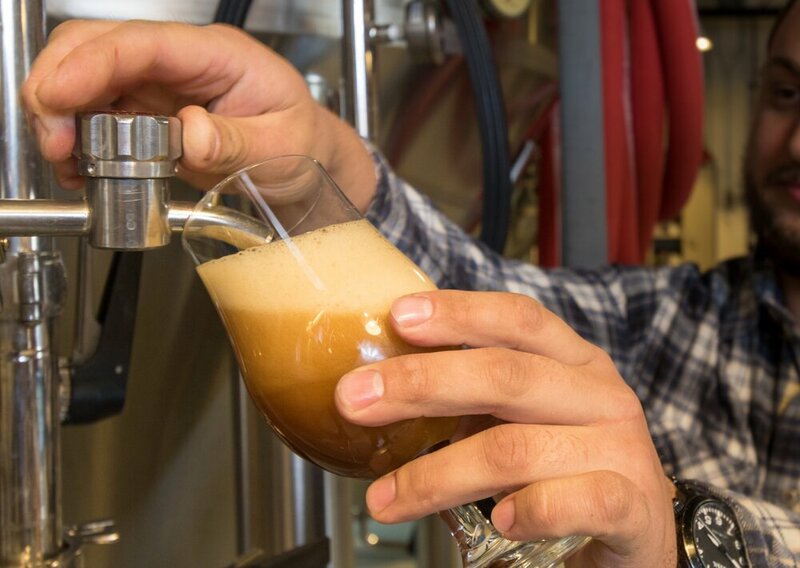 Chris also has a Master of Science in Biochemistry from California State University of Long Beach, which has helped him to achieve an even higher level of quality in his brewing.